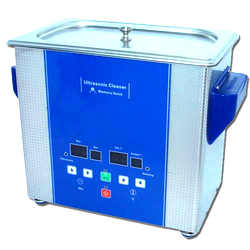 Tanco Single tank ultrasonic cleaners are most often used for small number of parts and various instruments for rapid cleaning used in General, Medical and Scientific Labs, Industries, Jewelers etc. Compact, rugged and highly durable system having small transducers with the generator, S.S. tank 304 Grade with or without heating. High frequency electrical energy is converted into ultrasound waves by means of ULTRASONIC TRANSDUCERS with Efficiency of 90%, which permits maximum cleaning action having low power consumption. Digital 99 min pre-settable timer. workable on Single Phase 220 / 230 volts A.C. supply.